Analysts say it’s not a question of if, but when the bonds of General Motors and Ford Motor will slide below investment grade, probably late this year. The once triple-A-rated US automakers are flirting with high-yield status, and the outlook is negative from the rating agencies. 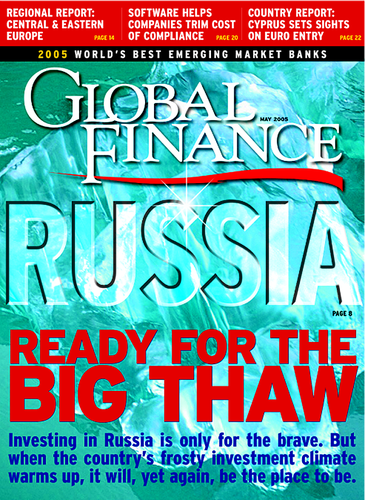 “If GM and Ford, along with their financing arms, join the high-yield space, they will account for 15% of the market,” says Kingman Penniman, director of research at Montpelier, Vermont-based KDP Investment Advisors, a firm that provides research and pricing services on high-yield bonds, including a daily index of the market. While GM and Ford are two of the largest issuers of corporate debt, with a total of about $475 billion outstanding, including the bonds of their profitable financing units, they should be assimilated easily into the high-yield sector, Penniman says. “Fallen angels are not a new phenomenon to the market, and the automakers will be considered as good credits by buyers of high-yield debt,” he says. With GM bonds yielding more than 500 basis points more than comparable US Treasury securities, they appear attractive to investors who can afford to hold on to them for the long term, he says. Many institutional investors, including pension funds, however, are not allowed to invest in securities that are rated below investment grade. 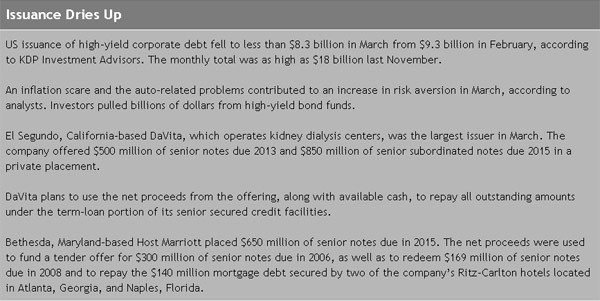 Some of these funds already are selling GM and Ford bonds in anticipation of another downgrade, according to Penniman. Meanwhile, about one-third of the participants in the high-yield market already have invested in GM debt, Penniman says. A drop below investment grade would increase borrowing costs for Ford and GM, both of which need to invest in new models to compete with Asian producers, which are gobbling up US market share. Toyota Motor of Japan, which makes the popular Prius hybrid model that runs on a combination of gasoline and electric power, could soon pass GM as the world’s largest automaker. Prices of the bonds of Ford and GM already have been beaten down so low, analysts say, that a downgrade to “junk” status already has been priced into the market to some extent. The yield on GM’s euro-denominated bonds rose sharply in late March after the automaker slashed its 2005 profit outlook and forecast a loss for the first quarter. The spread against US Treasury issues widened further when Standard & Poor’s issued a “negative outlook” on the automaker, indicating that the next rating change was likely to be a downward move. A downgrade wouldn’t precipitate liquidity problems for GM, which holds nearly $20 billion in cash and another $10 billion in credit facilities, says Scott Sprinzen, a managing director at S&P. ; General Motors Acceptance Corporation, or GMAC, the automaker’s financing unit, holds nearly $23 billion in cash. GM is relatively well positioned to sustain a downgrade, Sprinzen wrote in a recent note to investors. Ford cut its 2005 earnings forecast on April 11 and said it will not reach its profit target for 2006 because of rising gasoline prices and health-care costs. S&P; responded by cutting the outlook on Ford debt, which is rated BBB-, the lowest investment grade, to negative from stable. Daimler Chrysler, the number-three US automaker, has gained market share in the past 12 months, even as GM and Ford have lost ground to Toyota and other Asian automakers. 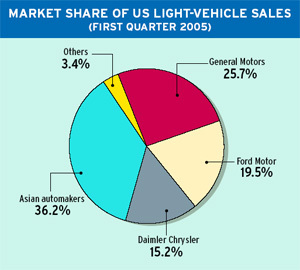 GM’s 25.7% share of the US market for light-vehicle sales in the first quarter of 2005, according to New Jersey-based Autodata, was the lowest since 1925. GM shook up its top management in early April, putting CEO Rick Wagoner in charge of day-to-day control of its core North American operations. “One of our biggest challenges is our lack of cost-competitiveness in the United States, which is due to our legacy costs, especially the ever-increasing burden of high health-care expenses,” Wagoner said in a statement indicating that he will be seeking concessions from labor unions. The US automakers have been forced to use price- and interest-rate incentives to convince consumers to buy their cars. Rising rates have made cash-back offers and zero-interest financing more costly. Meanwhile, GM needs to refinance or pay nearly $45 billion of debt in 2006, and Ford has $37 billion of debt coming due next year. Most suppliers for both companies already are residents of the high-yield neighborhood. 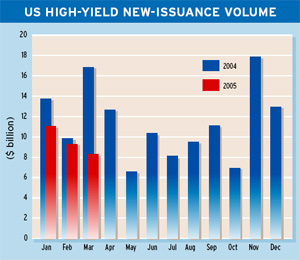 Auto contagion led to a noticeable pullback by investors in high-yield bonds in mid-April, says John Fenn, fixed-income strategist at Citigroup’s global markets division in New York. 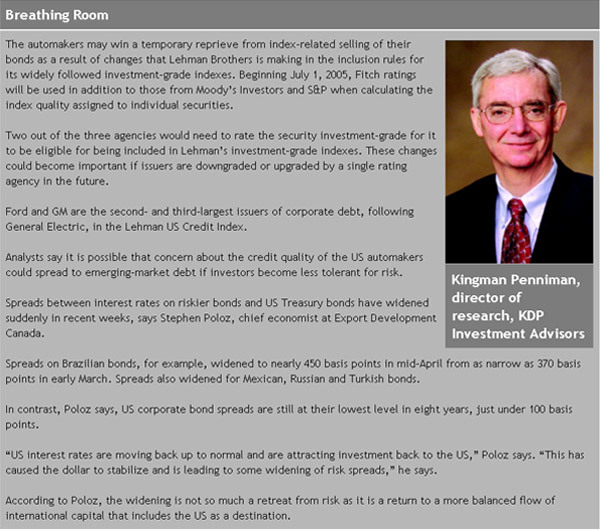 While the severity of the downturn in high-yield bond prices was hard to explain, it seems to have been triggered by the problems of the automakers, Fenn says. The market is bracing for the $140 billion mountain of GM and GMAC debt set to hit the market sometime this year, he says. “It strikes us that the increased volatility in the market has pushed investors to rebuild cash balances, as the market is suffering from a lack of confidence,” according to Fenn. The auto-parts sector was particularly hard hit. 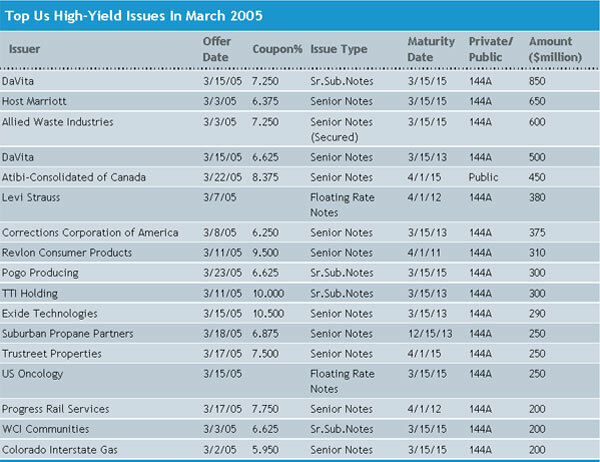 “With Ford and GM [yield spreads] widening dramatically, the relative value being offered by the parts companies is questionable when compared with the lofty yields being offered by both of the investment-grade credits,” Fenn says. But in a clear case of the good being thrown out with the bad, some higher-quality parts suppliers, such as Lear, American Axle and TRW, have been oversold and appear extraordinarily cheap, he says. “Sure Lear has exposure to Ford’s production schedule, as well as GM’s, but the Lear operators know about Ford production cuts before [CEO] Bill Ford does—and they plan accordingly,” Fenn says.